At BIAFF 2014 Pork Chop Pictures won a Diamond award, Best Comedy and Best Editing for SoulMatrix . When Pork Chop Pictures produced its first short film back in 2009, it was not a great success. Our first venture was to enter the Sci-Fi London 48hr Film Challenge, where we were given a title, prop and line of dialogue to include in a 5-minute film. Deeper Still was made, a sci-fi comedy about a henpecked husband who drives off after a row with his wife and accidentally runs over an alien. It was as bad as it sounds. Let's just say it was a valuable learning experience and we hope it never sees the light of day again! A few years later, with our shame buried deep(er still) enough to bother us no longer, we decided once again to revisit telling a story with sci-fi elements. We also wanted to make something that required more visual effects work in addition to the character work we try to stick to, so Pork Chop Pictures co-founder Carl Austin came up with a technology for us to explore. That technology was one that would allow people to generate holographic recreations of others in their own homes. Thinking about who would have use for such a thing, Carl's initial idea was shy singletons using it to practice going on dates. They would collect data from their intended subject (shoe size, hair fibres, etc), and enter the information into their machine to create that person. They would then be able to sit down and practice talking to them in a way they weren't ready for in the real world. SoulMatrix started to take form. It didn't take much discussion to realise how utterly creepy this could be. We had to decide in which direction to take the story in terms of tone, and that direction would be heavily influenced by our mutual love of 80's movies (and an obvious comparison with 'Weird Science'). We wanted an underdog and not a creep, a main character our audience would sympathise with despite the clandestine way he explored and expressed his feelings. Choosing to simplify the way in which he gathered information, taking photos of the object of his desire instead of collecting samples, would help but it would really all come down to the actor playing the part. Having worked with Paul F Taylor on a previous short comedy called Writers Block, we knew if anyone could win over an audience it would be him. Such was our confidence in Paul to deliver, after talking the idea through with him we decided to boil the tale down even further - to tell this story without dialogue. Of course, alongside Paul we needed an actress to play the understandable object of his affections. It had to be someone equally engaging on screen, and especially playful to play all the different holographic versions of herself. Lauren Shotton, who like Paul does a lot of live performance comedy, was the perfect choice. The physicality, presence and expressive nature of both of them was exactly what we needed. The decision to go without dialogue had pros and cons. In practical terms, not having to record synced sound during production made life a lot easier. Other than some atmospheric tracks to include, there were no lines to get wrong, no takes to be spoiled by outside noise and it would save us a lot of time. Another big plus was that without using spoken language we would be able to show the film to non English-speaking audiences, so it could travel even further a field. The challenge, however, would be to put across the characters and tell the story without the benefit of dialogue. We couldn't 'tell' the audience anything. Everything we wanted them to feel about both of these aspects had to come from an entirely visual perspective. As a director this was the biggest challenge. In addition to the performances of the cast, we also needed locations and props that would put across what we were trying to do in that visual way just as quickly. Without the budget or time to make up or dress an office setting, we were fortunate enough to have access to the real thing thanks to co-producer Geoff Harmer. Shooting on a weekend on a floor that was not being used at that time, we had the perfect place to film a significant portion of the story. The second main location was a room above our much-loved Basingstoke pub The Way Inn - the landlord of which actually stars in the film as the disapproving boss. Then we needed the 'Holobox', the gadget that would make the magic happen. Leon Mook is a very talented craftsman who had helped us with a key prop on a previous short called Fishcake. This time round we explained that we wanted something that would look like a piece of kit people would buy, like an Apple product, rather than something someone builds at home. Leon took our brief and created for us exactly what we were looking for. It even lit up! To continue this Apple theme, we decided the 'Holobox' would be operated with an app. 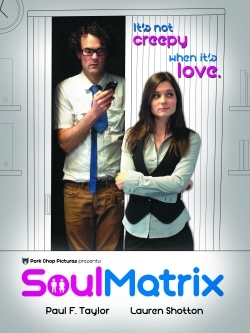 Originally, we thought we would have to cheat this in post-production, but to our delight Dave Folan and Nick Lanng actually created a working SoulMatrix app that we shot being used in the film. It added a layer of authenticity the likes of which would have been hard to achieve with computer effects in the edit. With our cast assembled, locations sorted, props and software ready to go and Wimbledon on the telly it was time for our weekend shoot. As with most shoots, it wasn't without its hiccups. On the Saturday we first filmed Paul's bathroom/bedroom scenes and then moved on to the pub to shoot him using 'SoulMatrix'. To do this, a light-stand was put in place with a post-it note denoting what would be Lauren's approximate eye line. It was against this that Paul had to act out his side of the entire hologram scene. At the key moment of the film where Paul gazes into the holograms eyes and decides he's going try actually speaking to the real thing, in reality he and Lauren had not even met yet. In fact, once we finished shooting this scene with Paul in the pub, we headed back to the kitchen of Pork Chop HQ where Carl set up a green screen backdrop. In front of this is where Lauren would perform all the holographic variations of herself. While eating, drinking and listening to music we filmed all of Lauren's incarnations for the rest of the Saturday evening. Myself, Carl, Lauren, make-up artist Sarah Jayne Gilly and production assistant Seb Hall all agreed it was the easiest and most fun shoot we've ever done. Of course, the main office shoot was the following day and the contrast to the night before was rather striking. Our first big problem was a distinct lack of extras after being let down by a number of people on the day. We thanked the heavens that Elliott James Burns, Jenny Mitchell and Peter Bradley were kind enough to come along, suitably attired for a day at the office. However, it was a large office! As a result, there are various shots in the film where you will see all the crew in various outfits appear in the background as workers at some point. One shot in particular actually has everyone who was there in frame while the camera was locked off and filming. In fact, it's a shot from Paul's point of view while sat at his desk looking out across the office - and the very eagle-eyed among you may see Paul is actually in that shot too! Continuity fans will have a field day with that whole scene. The unused office floor would also start to become a problem in itself. While there were the bare bones of a working office there, we had very little to work with in terms of props and set design. Desks were bare, phones weren't plugged in, and computers needed setting up. A lot of the time we saved not recording sound, we lost on set dressing and setting up shots with few extras. Despite these hitches, there were some wonderfully serendipitous moments caught as a result of the environment we found ourselves shooting in. The 'one-way' sign on the building pointing outwards from the entrance Paul is trying to get into at the start is my personal favourite. Also, Paul squeezing himself to his desk came as a result of the positioning of actual furniture in the room, so was written into the script. However it was Jenny who had the idea of Elliott getting up and walking away right after he'd reached his seat. Everyone there on the day chipped in with ideas and had input, it was a real team effort. We were able to film enough of what we needed despite the numbers of personnel we were missing, and the fact we all kept drifting toward the iPad to watch Andy Murray playing at Wimbledon. We suspect this may be why we had so many absentees, plus the fact it was a gloriously sunny day! However, we wrapped principal photography and Carl was soon ready to get to work on the edit. After putting a rough edit together of the material we shot, Carl then got to work on designing how the hologram would actually look on screen. It was important for the interaction between Paul and Lauren that her hologram looked as human as possible. If he was to feel a connection towards her/it, and by extension the audience to recognise that connection, the hologram had to appear life-like - for example, not too many people would be taken in by the static-ridden blue hologram of Princess Leia at the start of Star Wars. At the same time though, this is still a hologram - so there needed to be a layer of effects used as a subtle reminder of that throughout her time on screen. Our desire to make a film using more sophisticated visual effects kept Carl busy. All the area filmed around Lauren during the green screen shoot had to be digitally removed. Then to those shots, various effects such as distortion, noise, different blurring styles and lighting had to be added to create the hologram effect. With some motion-tracking techniques also required, it was then a case of inserting 'holo-Lauren' into the shots where Paul is giving the most appropriate reaction to her performance. Once the video edit was finalised and married with the completed hologram shots, we then had to add a music track that would reflect the 80's style of storytelling we were going for. This would be the final piece of the puzzle and musician Stuart Smith kindly got involved, composing several pieces of score which helped to perfectly cement the retro nature of the film. Making SoulMatrix was a brilliant experience, with a team of wonderfully generous people behind it. We would all like to thank the BIAFF and the IAC for their response to the film, glad that it was as much fun to watch as it was to make.